Review: Carter Kane has been living out of a suitcase, traveling around the world with his father, a brilliant Egyptologist, Dr. Julius Kane. This is because six years ago, his mother died by a horrific accident involving magic. But while he is being homeschooled by his father, his younger sister, Sadie, is living in London with their grandparents. Sadie has just what Carter longs for—a “normal” life and some cool school friends. But, what Carter has, Sadie longs for—time with their father. The kids have almost nothing in common with each other… until now in the exciting premier novel in the Kane Chronicles Series, The Red Pyramid by Rick Riordan. Carter and Sadie are reunited on Christmas Eve, when their father brings them to a British Museum not far from Sadie’s home with a promise that he’s going to “make things right”. But, what Julius planned does not happen; instead of his plan, he summons a scary statue that banishes him and creates a blistering outburst. Soon enough, Carter and Sadie find out that the gods of Egypt are waking from the Duat and that the nastiest of them—Set—has in mind a hazardous scheme to take control of the world. To save their father, they must embark on a crazy quest that brings them farther from safety and closer to their own history, which is linked to the old House of Life, a covert order existing since the time of the first pharaohs of Ancient Egypt! From the author of the bestselling series, Percy Jackson & The Olympians comes this first of The Kane Chronicles, mixing non-stop achievement, humor, anticipation, and suspense in a grand story of valor and conformity. The Red Pyramid is great. It makes readers want to read it, plus it is a long book, so it doesn’t end quickly. My favorite part of the book is when Muffin (Sadie’s protector cat) turns into Bast, the goddess of cats, while Amos Kanes’ house is under attack by magic demons. She starts fighting them by using her long knives. I also liked the chapter names in the book. Mr. Riordan always makes them very funny, such as “Muffin Plays with Knives”, or “I Face the Killer Turkey”. 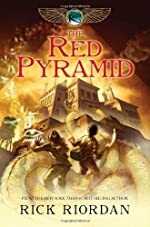 The Red Pyramid lives up to Rick Riordan’s usual excitement and adventure – making him one of my favorite authors! The first book in The Kane Chronicles also received many praises from different people, such as The New York Times #1 Best Seller, and Magazine.com. So, in short, The Red Pyramid is an awesome book, and I just can’t wait until the second book in the series comes out. We would like to thank The Mehta Family for providing a copy of The Red Pyramid for this review. Have you read The Red Pyramid? How would you rate it? I think karan did a good goob reviewing it and that inspires me to read the book Red. I agree with Karans review I have read Red Pyramid also It is a awesome book. I read the book and loved it almost imeditly i also like the humor put into it by the author, as you said Rick Riordan has created another one of his advetures books, ps Karan this review is amazingly true about the humor adventure and excitement!!! I read this book and I loved it as well! I think that this is a very educational and informational book. There arfe so many facts in this book about Egyptian mythology. I think that Rick Riordan is an amazing author. I have read all his books and loved each and every one of them. I have to agree with Karan, this is a great book! The Red Pyramid is quick-paced and full of vitality. The energetic narrative voices remind me a lot of the feel of the Olympians series, with the added benefit of having Carter and Sadie's POV's swapping out every two chapters, so the reader doesn't ever feel stuck in one place for too long. I really adored Sadie's POV, since she's a sarcastic 12-year-old who's been raised in England, but Carter's voice is fine, too. The story also has plenty of humor thrown in to break up the constant peril, such as the antics of Khufu, a hyperintelligent baboon guardian, who only eats foods that end in the letter.